Info "Don't poke your eye out!" Contact Lens Solution is one of Kat and Ana's microgames in WarioWare: Twisted! The game's purpose is to guide a finger with a contact lens on it to an eye. To do so, the player has to press at the right timing. If done so, the game is won. However, if they miss the inside of the eye, they lose. 1st level difficulty: There is a big eye. 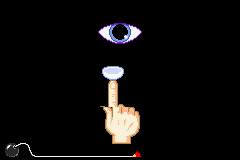 2nd level difficulty: There is a small eye. 3rd level difficulty: There are four tiny eyes and four fingers. The background music is someone humming the Super Mario Bros. theme. When the hand put the lens on the eyes, the sound effect of Mario getting a power-up in Super Mario Bros. plays. This page was last edited on October 29, 2018, at 21:21.